Normally, I am the only one who gets to see my artwork as it evolves. I thought others might be interested in seeing that process. A WIP is a work in progress, a work that isn't yet finished, a work that I am still having a dialog with. The process begins with something I've found. Then I begin to arrange natural objects, along with paint and manmade objects on my chosen "canvas." In the past this canvas has been a piece of tree bark mounted on a pine panel. (If you want to see an example of a bark piece, visit my shop: http://www.etsy.com/shop/Raedawn) This will be the first natural assemblage that isn't mounted on bark, but instead will be mounted on a shallow wooden box. One day I was walking down the ramp to the loft building that I live in and I came across a tangle of thin branches. I looked at it, picked it up and looked at it some more, and then put it back. The next time I was on the ramp, I decided to take it home. Even if it was fragile, I wanted to make something with it. That was when I noticed the rest of an abandoned nest in the rafters above the ramp. Then I looked over to the next section and saw a Robin sitting on a nest. I had an abandoned Robin's nest ... what a precious treasure. I went and talked to the Robin, who seemed to sit and listen patiently because she didn't fly away. 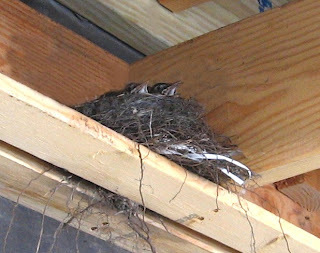 Later my husband and I would see the little baby Robins in their nest. This added an even greater to the artwork I had already begun. What you see here is the next stage. I went back to the table, put the nest in the middle, put a torn photo of myself behind the nest and added another snake. This time the two snakes were then arranged in the V shape you see in the piece above. I also added a small beautiful stone. The next time my husband walked by he said, "Wow, oh now I get it." He didn't realize what I had already known ... that I would be moving the nest to the center. So this is the stage the work is in now. I want to saturate the picture of me and print a smaller version so it's easier to see the face within the nest. And, of course I need to paint the snakes as well as the pine box it will be mounted on. I'm not sure what else I might add ... stay tuned. You can see a picture of the baby birds too, above. Aren't they too cute. Very cool, I love the nest, mother nature certainly has her ways. I am looking forward to seeing this finished. Great to watch your process! Love the nest and the babies are precious. Yes those babies are too cute. Thanks for sharing your WIP. Always fun to watch a creative mind. I'm very partial to fine and delicate pieces from nature, so I love using this nest in your WIP, Rae! Can't wait to see the finished work!